We have all been waiting for some rain to put flow and colour back into the River Nene after months of very little of either - the main ingredients for good catches. Unfortunately it all came too late for round one of the annual Deeping St James v Yaxley/Farcet/Holme team challenge match on the River Nene at Wansford. In fact the fishing and weather were both atrocious. Yaxley won it with an overall team weight of just 2lb 1¼oz to Deepings’ paltry 13½oz. Winning individual was Ivan Marriott on peg 18 with 1lb 5½oz. Runner-up was Mel Saggers on peg eight with two perch weighing 9½oz and third Paul Dotchin on peg 21 third with 6¾oz. 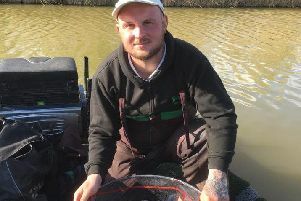 Simon Easy won the Rookery Waters Open on the Magpie Pool on his first visit to the venue. He pipped Mark Pollard after both caught carp up to 5lb. Easy had an impressive 136lb 2oz compared to Pollard’s 123lb 10oz. Colin Edwards was third with 81lb 14oz followed by Richard Linnell with 47lb.